READY TO GET TO THE ROOT PROBLEM OF EMPTY DENTAL CHAIRS? Admit it… you can always benefit from new patients, especially cash-paying ones, but regardless of all the marketing you invest in, your chairs are still not filled to capacity. Sure, a lot of that stems from the general fear consumers have in going to the dentist and how they’re not exactly rushing to book a root canal but it doesn’t help that the dental industry has changed. Corporate dentistry is moving in and taking over with their corporate-sized marketing budgets expecting to represent over 30% of all practices in 2021. As a private practice, how do you plan to survive this onslaught and most importantly, are you ready to get in the game? HOW CAN DENTAL GENIE HELP? What’s critical to understand is how we’re different from the online directory listings that have been around for years, those same directories that you may already invest in but still don’t fill your dental chairs. We are the first and only online dental marketplace to offer ratings, reviews AND pricing. Yes, we said “pricing” – pricing for all of your procedures so consumers overcome the biggest reason they don’t go to the dentist – fear of the unknown cost. We are an exclusive, first-come, first-service network of pre-approved dentists who realize the dental industry has changed and price transparency is required to level the playing field with corporate dentistry. And we get that dental patients shop differently today. In today’s instant gratification world, consumers expect all the information they need at their fingertips, especially those requiring immediate treatment and those with limited or no dental insurance so consumers overcome the biggest reason they don’t go to the dentist – fear of the unknown cost. Attract new patients with immediate treatment needs leveraging our Marketing budget & efforts! 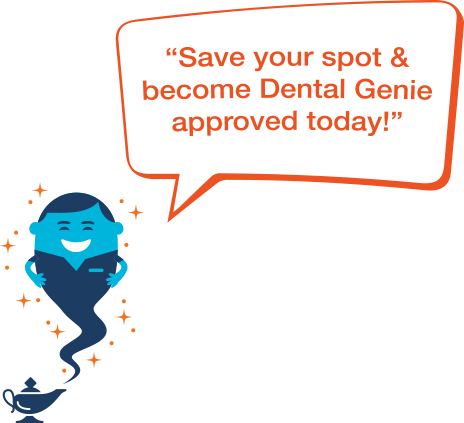 Benefit from more personal attention from Dental Genie due to our limited number of pre-approved dentists! Gain a strategic marketing partner in the "fight" against the increasing number of corporately-owned dental practices! For a nominal month-to-month fee, approved dentists receive marketplace placement based on a first-come, first-serve basis. Right of the bat that means you’re positioned based on date joined rather than paid placement reducing your marketing costs while ensuring fair visibility within your geographical region. And remember, we’re an exclusive network of select dentists meaning we aim for quality over quantity!